A new group of "super-paramedics" is being trained in Wales to save some patients a trip to hospital. The mobile specialists will be qualified to use a wider range of medicines and will be able to offer to treat some patients at home. Former Army nurse Paula Jeffery, who is based in Tenby, is the first to take up the role in Pembrokeshire. 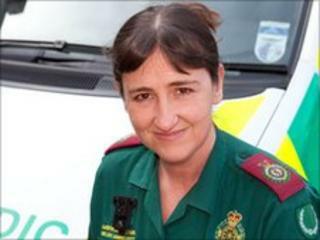 The Welsh Ambulance Service said she would be part of a network of highly skilled colleagues across Wales. It said it was the first such scheme in the UK. The first group of "specialist practitioners" has been chosen from the ranks of the service's paramedics and nurses. The service said they had undergone specialised training to graduate and postgraduate level to equip them to provide a level of care above and beyond the existing service. Consultant paramedic Andrew Jenkins said: "We're going to have a new kind of paramedic out there, an ambulance clinician, not just providing immediate emergency care but also making decisions about the sort of continuing care the patient needs. "They will often be able to treat patients at home, significantly reducing the number of people sent to accident and emergency departments and signposting them towards continuing care. "They will be able to consult and examine patients and devise a treatment plan, offer a range of antibiotic under Patient Group Directions (PGDs), as well as wound management." The service said each year up to one million patients were taken to hospital unnecessarily. Ms Jeffery, 40, from Carew, has been a paramedic for just two years but has 20 years' experience as an A&E nurse including eight as an Army nurse seeing service in the Falklands, Hong Kong and the US. She said: "The new specialist role should bring some really good gains here because if we can manage a patient at home then we are saving a two-hour round trip to hospital. "At the moment the only care pathway available to an ambulance crew is the A&E unit at their local hospital but a lot of patients don't need that sort of care which can tie up huge amounts of resources, especially in rural areas. "Clearly some people do need to go to hospital but huge numbers don't."